Lenton Times - Lenton Listener Articles - Accident! the steam crane as it started to clear the line. Early in the morning of December 16th 1971, shortly before dawn, a special freight train carrying 260 tons of coal from Bestwood Park to Derby gasworks, had come through Lenton South Junction and under Lenton Lane railway bridge on to the main line for Derby. At that moment the guard travelling in the brake van at the rear of the train was thrown forward, banging his head, as the train came to a sudden stop. Finding his feet again, he left the van to investigate the cause of the stoppage. Taking his lamp, as it was still very dark, the guard walked towards the locomotive. He soon found that four wagons had become derailed and thought that this was the reason why the train had stopped. Using a nearby signal post telephone, he informed the signalman at Trent Signal box. It was only after that he continued towards the locomotive and rounding the bend saw the full extent of what had happened. A parcels train from Liverpool to Nottingham had run into their train in a head-on collision. As a result of the impact, the locomotives were locked together, their cabs almost completely destroyed. One of the 17-ton parcel vans had been thrust up on to the roof of the locomotive and two others had been thrown out blocking the other lines. Realising the enormity of what had happened, the guard then ran to place detonators on the up-line to warn any approaching train of the danger, and then rang the signal man to call out the emergency services and to close off all the lines. after it had been pulled free. The ambulances and fire engines reached the accident about fifteen minutes later and then began the rescue efforts. For still trapped inside the wrecked locomotives were the two drivers and the guard from the parcels train. It was three and a half hours before the fire brigade managed to release the driver of the coal train, but despite all efforts, he died shortly afterwards in hospital. Sadly, the driver and the guard of the parcels train were both found to be dead when they were finally extricated some eight hours after the collision. Even with hydraulic jacks, winches and steam cranes, it was almost twenty-four hours before all the lines were finally cleared. When railways are compared with road and air travel, they are considered to be a very safe form of transport, but occasionally accidents do happen. However, head-on collisions like the one in Lenton are a very rare event indeed. So how had the accident happened? Had it been a mistake on the part of one of the drivers? Had the signalman been at fault or was it perhaps some sort of signal failure? To try and discover the reasons, an assessor for the coroner from the Railway Inspectorate sat at the Inquest in February 1972. From his examination of the witnesses and the testing of the signalling, the Inspector felt he could rule out any signal failure. Moreover, the signals had been correctly set for the coal train and it was found to have proceeded under clear signals. The Inspector also thought that no blame could be placed on the signalman's actions. This left the driver of the parcels train. There seemed no way of explaining why he should have missed the signals. The Inspector could only assume that the driver was drowsing or otherwise inattentive and had failed to realise that he was running into danger. The sole responsibility for the accident, the Inspector felt, had to rest with the driver; a charge sadly which the driver could never answer. There were no suggestions that the driver was suffering from any illness or condition that could have incapacitated him or affected his ability to drive the locomotive. The position of his body after the crash indicated that he had suddenly become aware of the impending collision only a few seconds before it occurred and having shut off the power and put the brake handle into the emergency position, was making an attempt to leave the cab when the impact took place. He had applied the brake too late. Those who pass along Lenton Lane may notice a number of ex-railway vans, 'parked' at the rear of Turpins Cash & Carry Warehouse. Although they lie alongside the site of the collision, they are not the damaged vans as some believe. The confusion simply arose from the fact that shortly after the damaged vans were removed, Turpins bought some vans from British Rail to use as storage units. "The impact was head-on between the leading locomotive of the coal train, running cab leading and the locomotive of the parcels train which was running with No. l end leading. The position of the two trains after the collision is shown on the attached diagram. 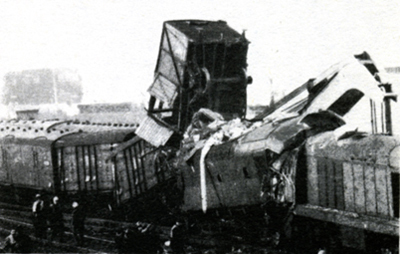 As a result of the impact the locomotives were locked together, with their cabs almost completely destroyed. 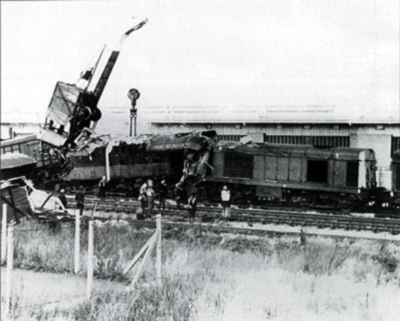 The locomotive of the parcels train was forced back some 20 feet, derailed, and lifted off its bogies. The 3 light, short-wheelbased vans in the parcels train, which were marshalled immediately behind the locomotive, were thrown out, 2 on their sides onto the Up line and one onto the roof of the locomotive. 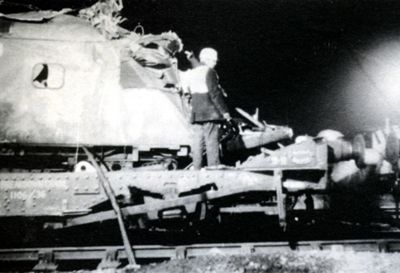 The fourth vehicle of the parcels train, a Southern Region type PMV, had been driven deeply into the rear cab of the locomotive which was crushed in as far as the boiler compartment bulkhead, and another PMV behind it had been driven into its rear end. The remaining 8 vehicles of the parcels train were undamaged and came to a stand still occupying TC 574, the overlap track circuit of Signal TT 302, thus holding both that signal and Signal TT 335 at Danger." Lenton South Junction also featured in a rather bizarre mishap some 90 years before. Early in the morning of Tuesday 15th November 1881, a railway employee, walking along the line, came across the dead body of a young man lying between the tracks at the junction. After running for help from the man at the level crossing on Church Street, he helped carry the body to the White Hart Inn. There a doctor examined the dead man but was unable to decide what had caused the all too obvious injuries. Had they been the result of a carriage passing over him, or from a fall, or more sinisterly the consequence of an attack by some unknown assailant? An inquest was held the following day at the White Hart Inn to determine the cause of this man's death. It soon became apparent, however, that foul play could be ruled out. The deceased, one George Henry Charles Bennett, 21 years of age, had arrived at the Midland Railway Station shortly after eleven o'clock Monday night, just as the Beeston train was about to depart. Bennett had run along the platform and put his body halfway through the open window of a carriage and appealed to his fellow travellers to pull him in. This they had done. He soon noticed though that the train was going the wrong way and asked 'Am I right for Mansfield?' On being told he was on the Beeston train, Bennett exclaimed that he did not wish to walk the four miles back and so as the train slackened speed at the junction, he opened the carriage door and jumped out into the darkness of the night. The tragic consequence of his act was to be revealed the following morning. Some of the jurymen questioned whether the injuries Bennett suffered could solely be attributed to his landing badly, especially when the train was thought to be travelling at about only eight miles an hour. But the coroner assured them that, unless the body had been hit by another train while it lay there, this must indeed have been the case. The jury accordingly returned a verdict of accidental death.